Authors: P. Simon, ... , M. Kilbinger, et al. We study the correlations of the shear signal between triplets of sources in the Canada-France-Hawaii Lensing Survey (CFHTLenS) to probe cosmological parameters via the matter bispectrum. In contrast to previous studies, we adopted a non-Gaussian model of the data likelihood which is supported by our simulations of the survey. 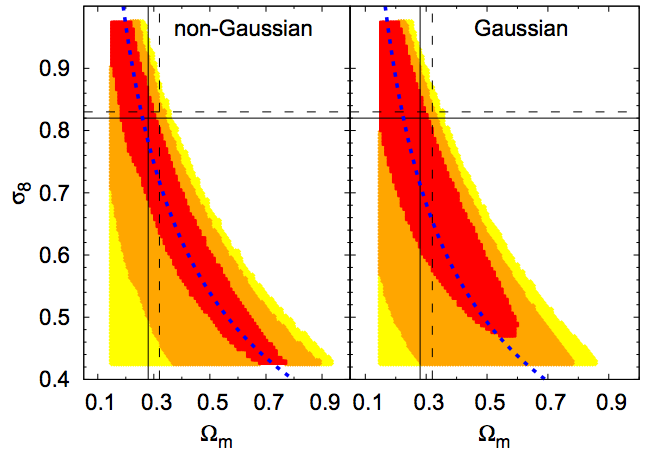 We find that for state-of-the-art surveys, similar to CFHTLenS, a Gaussian likelihood analysis is a reasonable approximation, albeit small differences in the parameter constraints are already visible. For future surveys we expect that a Gaussian model becomes inaccurate. Our algorithm for a refined non-Gaussian analysis and data compression is then of great utility especially because it is not much more elaborate if simulated data are available. Applying this algorithm to the third-order correlations of shear alone in a blind analysis, we find a good agreement with the standard cosmological model: Σ8=σ8 (Ωm/0.27)0.64=0.79+0.08−0.11 for a flat ΛCDMcosmology with h=0.7±0.04 (68% credible interval). Nevertheless our models provide only moderately good fits as indicated by χ2/dof=2.9, including a 20% r.m.s. uncertainty in the predicted signal amplitude. The models cannot explain a signal drop on scales around 15 arcmin, which may be caused by systematics. It is unclear whether the discrepancy can be fully explained by residual PSF systematics of which we find evidence at least on scales of a few arcmin. Therefore we need a better understanding of higher-order correlations of cosmic shear and their systematics to confidently apply them as cosmological probes.